Developer 8 Points has revealed The Wild Eight, a top-down survival game that will put you once more into the fray in Fall 2016 on PC and Xbox One. 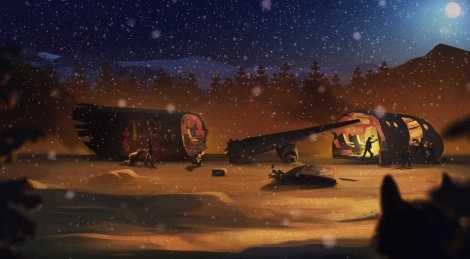 After a plane crash, eight people find themselves in the middle of Alaska's wilderness and you play one of those survivors. A few more details, screens and trailer inside. In no time everyday life of eight people changes forever. They have just survived a mystic plane crash and now find themselves in the middle of horizonless winter forest in Alaska. An unknown world full of challenge and danger surrounds them. You are one of the survivors. Act on your own or join efforts with other players and do your best to get back home! * Try to survive and explore the forest side by side with other players. It’s the right way to stand against this harsh world... until a madman appears in your group who wishes to grab the catch. Or to taste the human flesh. * Where did all these deserted buildings and mutated wolves come from? Solve all the puzzles of this place to get out of here. Coming Fall 2016 for Windows and XBOX ONE. I really like the art style of the game. "Try to survive and explore the forest side by side with other players." Hmmm... can I play alone?